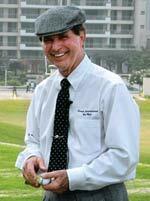 When it comes to credentials, Dr Wiren could very well be the biggest name in the business of golf instruction to visit India. There is something about a classroom setting that induces drowsiness. Largely illegible instruction dished out in that monotonous drone with nowhere to escape, all of it ends up being quite heavy on the eyelids. This goes back a little while but I remember times from school when you could pick up strains of snoring in the midst of a teacher’s lecture and there have been instances of classmates sliding off their chairs in a stupor. The look on their faces finding themselves sprawled on the floor and the teacher’s reaction would revive the class for a bit. But then, once in while, there comes along this man of wisdom who actually makes you sit up and take notice. You end up listening to what he has to say and you feel you have gained something from the experience. Golf instruction may not necessarily fall in the same category since this is more out of choice than compulsion, but there are some instructors who are more sought after than others because they combine knowledge and experience with a style of delivery that makes it fun to learn. Dr Gary Wiren fits the bill here and he happened to be in the country recently. When it comes to credentials, there is little better in the world of golf and Dr Wiren could very well be the biggest name in the business of golf instruction to visit India. The PGA Hall of Famer has written 11 books and his last one When Golf is a Ball was considered to be the best golf book of 2004. I first ran into him at the World Scientific Congress of Golf at St Andrews about a decade ago where he was the keynote speaker and even though he is into his 70s now, his zest for the game and teaching remains undiminished. Dr Wiren lives in North Palm Beach, Florida, and is currently Senior Director of Instruction at all Trump golf properties. Apparently, Donald Trump plays a pretty mean game of golf despite having no time for practice. About 50 per cent of the score on that card comes from the people he plays with. Then comes the rest: ball striking, 10 per cent; the aesthetics, beauty of the golf course about the same; and finally, the exercise. Of course, the plus fours, stockings, tie and tweed cap must also be playing a part in grabbing attention. “I’ve dressed like this for 40 years. People will see me three fairways away on the golf course and go, ‘There’s Gary’, and then you walk by them in the mall and they wouldn’t know who you are! It’s a statement.” It’s not just packaging here, there’s plenty of substance, too.